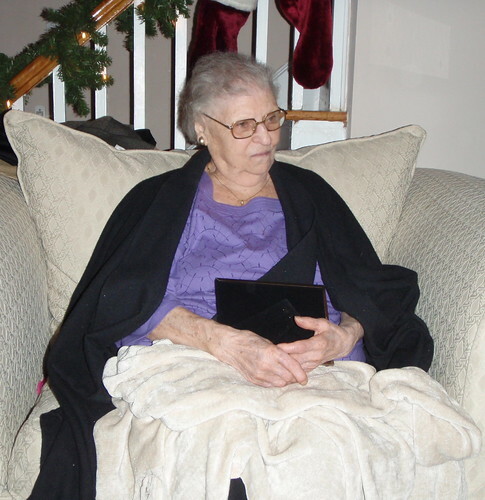 Julia’s Mom passed away on Tuesday, March 12th, after a short illness. She was 91 and filled each and every year with love and a sharing spirit. Details here. Grace D’Amato at her 91st Christmas Eve. We will all miss you so. 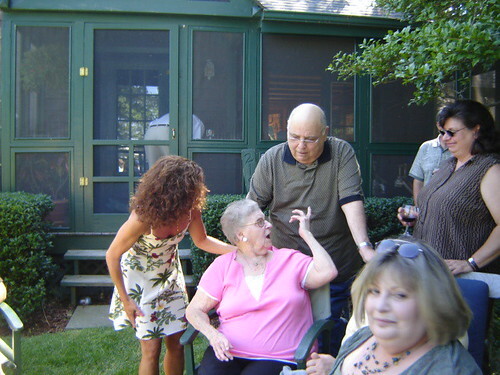 Summer before last, Gracie’s 90th Surprise Birthday Party. 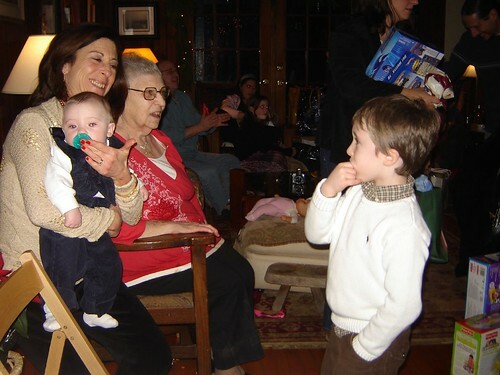 Christmas 2007; Gracie enjoying the Greatgrands. Julia: It is very pleasing to know that your mother had such a long, productive and loving life. I know however , from personal experience, that one never really gets ready for Mom not being around. Please find some element of comfort in the fact that she is now in her Heavenly Home, a much better place. Our prayer are with you and the family. Sorry for your loss, my thoughts and prayers are with you and your family during this difficult time. Dear D’Amato family, Grace was a wonderful lady. She was loved by everyone. There is no way anyone can forget someone as special as her. She will always be with us in our hearts and in our memories. Dear D’Amato family, I am so sorry for your loss. Grace was a wonderful lady. She was loved by everyone. There is no way anyone can forget someone as special as her. She will always be with us in our hearts and in our memories. Dear D’Amato family, I am so sorry for your loss. Grace was a wondeful lady. She was loved by everyone. There is no way anyone can forget someone as special as her. She will always be with us in our hearts and in our memories. Julia, I am so sorry for your loss. I know how special your mom was to you and your family. You always shared so many funny stories about her. She was quite a lady. Full of life and love for her family. I feel like I knew her even though we never met. I pray that you and your family find comfort in the wonderful memories you have of your mom. May God bless your family with comfort and peace. Dear Julia and Family, Sorry for your loss and my thoughts and prays are with you always. Julia, So sorry for your loss. I believe I met your Mother when we worked at USF&G, she was such a nice lady. May you and your Family find comfort in the days ahead. Keeping you in my prays. Dear Aunt Grace, I am so sad. Thank you for loving me and my sisters and brother our whole lives and especially after Mommy died. You lived through a lot of sadness and now you rest in a happy place surrounded by so many loved ones. I will always love you. Till we meet again…. Dear Lisa and family,I am so sorry to hear about your grand-mother. May the love of God, ,family and friends comfort you all during this time and always. It was a privilege to know Gracie. We enjoyed her wonderful smile and the delicious food she sent home with Julia! Her family was blessed with her support and love for many many years. Great memories growing up just down the street. I am sorry for your loss. We are so sorry to hear of your Mom’s passing. Our deepest sympathies go out to all of you. May God Bless you at this time.